Kao Denero's most popular video on YouTube has only had about 26,000 views but don't tell that to his fans in Freetown, Sierra Leone. 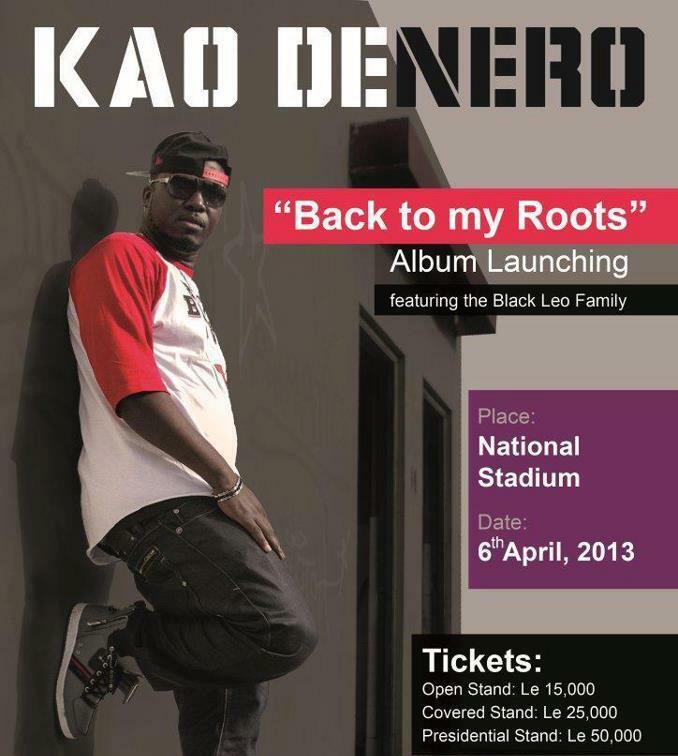 Thousands have spun Denero’s popularity into musical stratosphere, leaving the Koroma administration behind the curve. Last May, the musician who boasts a huge following among Freetown’s Generation January 6, 1999 was courted by no less than President Koroma who invited him to peace talks at State House after an ugly spat with another musician threatened to upend the city's peace. Almost a year on, the tense rivalry between LAJ and Kao Denero spilled onto the city’s streets Friday after the police cancelled Denero's album launch. "I was an eye-witness to the Kao Denero gangster violence last evening along the streets of Freetown," Sylvia Blyden told Sierra Leone Issues on Friday. "Half-naked young men, some of them only wore boxers with black handkerchiefs tied over [the] lower half of their faces or black/white bandanas around their neck, took over the streets,” Blyden said. “It was traumatic! Violent acts all around on innocent women and young kids. I am told the same violence happened all along the route from East into Central Freetown. It was like REBELS advancing into the city,” she said. In the early hours of January 6, l999, rebels of the Revolutionary United Front (RUF) took control of street after street in an offensive against the Sierra Leonean capital, Freetown. The battle for Freetown and the ensuing three week rebel occupation of the capital of over one million inhabitants, marked the most intensive and concentrated period of human rights violations in Sierra Leone’s civil war. Blyden said at one point her bodyguard rushed out of her car to save a boy who was being beaten up at the junction of Siaka Stevens Street and Wilberforce Street. “The boy's crime? He had on a red shirt! And Kao Denero's thugs were attacking and wounding anyone wearing red clothes which they allege to be the color of rival musician LAJ." Red also happens to be the color of choice for the ruling All People's Congress political party headed by President Ernest Koroma. "The truth is that despite all efforts to rehabilitate these musical gangsters, which went as far up as involving the Head of State at one point, has yielded not as much dividend as expected,” Blyden admits. “The painful aspect is that these guys will NOT do this in America. They come here and have their “fans” perpetuate criminality and want to be allowed to go scot free because they enjoy the support of chunks of youths." Kao Denero, born Amara Denis Turay, has lived in Atlanta, Georgia for more than a decade. Other sources say after attending the storied St Edward's Secondary School at May Park, Kingtom, he moved to the D.C. Maryland and Virginia area in the United States. " I first met him in C[alifornia] during Emmerson's first US tour in 2003 or '04," said Muhammad. " I was introduced to him by my brother-in-law in the presence of Aki Noah (one of the most famous Sierra Leonean impresarios)," he said. Born in Kaffu Bullom, Port Loko district in northern Sierra Leone, Turay attended the St. Augustine primary school in Tintafor. Somewhere over his career he adopted the name Keo/Kao Denero-- a pejorative of the Spanish Que Dinero meaning that money is used in. "What happened on Friday was not new,” remarked an old school friend of Denero. "Youths with no future that are always looking for such opportunities to unleash terror. They have succeeded to categorize you in the league of wayward people which I think is not correct. But, if they do, you have created the impression based on the happening around you,” Denero’s friend warned. “Amara, you need to examine your association especially one that has to do with your career as a music star. I am convinced you are the best in the trade, brilliant beyond compare, but rudeness, indiscipline and thuggery will not help you achieve such height. You have started losing face with people that matter in society and more especially with the political class, who are slowly branding you in their black book. Be wise bro for once, you need people that matter not thugs,” he advised. “There is no way the President will oppose the proactive measures taken by the police,” Blyden said. “State House supports the steps taken by the Inspector-General of Police to be proactive by banning the Kao Denero show," she said. Blyden, who was recently appointed as special executive assistant to the president of Sierra Leone, added, "There were so many breaches of the peace Kao should be held responsible for but instead he was given a mere slap on the wrist with just a ban of his show. 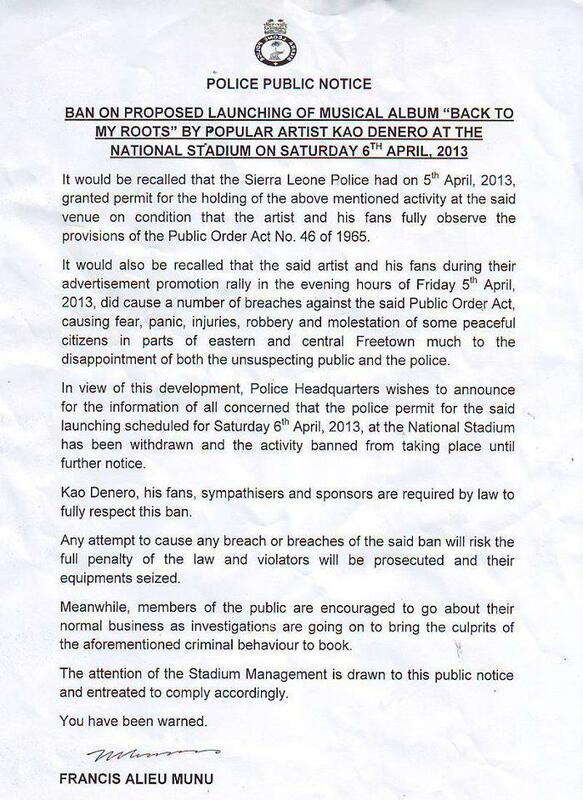 If Kao Denero had been made to sleep in a police cell last night, it would have sobered him up and made him realize the gravity of what happened to his fellow citizens at the hands of his “fans”. "As days go by am still asking questions that seem to have no answers,still wondering if realy any strong motivated blackleo fan will obstruct a rally that they know will tanish kao? Are there not holigans and thieves that exploits every chance they get during public events? Am still expressing my truthfull regret towards any individual that was affected by this whole mess thou some rightfully ague that its exagerated to the max to validate a decision. Am kindly apealing to the authorites to please take the consideration by allowing the people of sierraleone to have a second chance in enjoying a hiphop event that they have longed for months in the making. And to all my comrads please lets keep the peace..."